On August 6, 1883, Frank P. Merrill of Auburn, Maine, was elected the second Commander-in-Chief of the Sons of Veterans, U.S.A., at the Second National Encampment held in Columbus, Ohio. He was the first Commander-in-Chief to serve from the Division (Department) of Maine; an event which would not occur again for another 59 years. Frank Pierce Merrill was born on November 18, 1852, in Buckfield, Maine, to Thomas and Jane (Fields) Merrill. Thomas Merrill was mustered into the volunteer service on November 1, 1861, and served in Berdan’s 2nd Regt., U.S. Sharpshooters, Co. D, as well as the 17th Maine Infantry, Co. E, and 1st Maine Heavy Artillery, Co. E. Private Merrill was mustered out in September of 1865 and moved his family to Auburn, Maine, where he practiced his trade as a shoemaker. The years 1882 and 1883 were pivotal years for Frank Merrill and the Sons of Veterans, U.S.A., in New England. General Isaac Bangs of Maine, the Provisional Grand Division Commander of the 1st Grand Division (New England), interested Merrill in the work of the Order. In a few short months Brother Merrill resigned his commission in the state service to devote his entire time to assisting General Bangs in establishing Sons of Veterans camps. By the winter of 1882 he was appointed Senior Vice Commander of the Provisional Division of Maine. In January, 1883, Brother Merrill established Almon C. Pray Camp 2, Auburn, and became a charter member as well as its first Camp Commander. 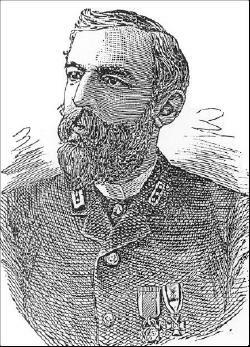 The First Annual Encampment of the Division of Maine was held on April 10, 1883, in Auburn and elected Frank Merrill as its first Division Commander. After his election to the Commandery-in-Chief in August, Commander Merrill called a special Division Encampment in October to resign as Division Commander in order to concentrate on his National duties. It was also in 1883 that another career move was made by Brother Merrill when he entered the employ of John Carter and Company of Boston as a traveling salesman. Although he left Auburn and took up residence in Dorchester, Massachussetts, he maintained an active interest in A.C. Pray Camp 2 and retained his membership in the Division of Maine. In his remaining years PCinC Merrill only missed two Division Encampments and then only because of conflicts with his business schedule. PCinC Merrill was also a member of Commercial Lodge No. 37, Knights of Pythias, Boston, and the White Mountain Traveler’s Association, but his heart’s love and devotion was given to the Sons of Veterans. On July 8, 1909, at the age of 56, Frank P. Merrill died of apoplexy in his Dorchester home, leaving behind his wife and son. In accordance with his wishes, his body was cremated and his ashes were buried in a funeral ceremony attended by officers and members of the Divisions of Maine, Massachusetts, and New Hampshire, as well as PCinC Joseph MacCabe of Boston. Four years later, the Division of Maine erected a granite memorial in the Ryder lot, No. 93 Grove Avenue, Mount Hope Cemetery, in the Mattapan section of Boston, to honor its first Division Commander and Commander-in-Chief. The memorial dedication was held on June 15, 1913, and once again over 500 members of the Sons and Auxiliary attended the parade, the unveiling and the orations at the cemetery.